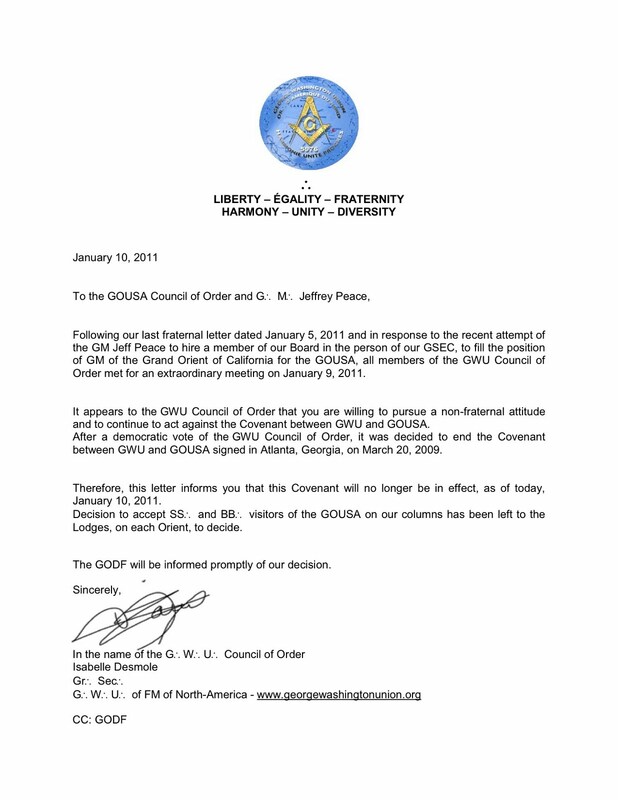 The George Washington Union (a Co-Masonic, US grand lodge) has withdrawn recognition and cooperation with the fledgling Grand Orient of the USA (click letter to enlarge). Both grand lodges are not recognized and are considered irregular by mainstream grand lodges around the world. The George Washington Union started with one lodge in 1976, George Washington Lodge No. 1, and received a charter from the Grand Orient of France in 1978. In 2002, it was established as its own grand lodge in the US, with the blessing and cooperation of the GO of France. Today it has just five lodges nationwide, and according to the 2006 World Masonic Report, the entire grand lodge had just 37 members that year. 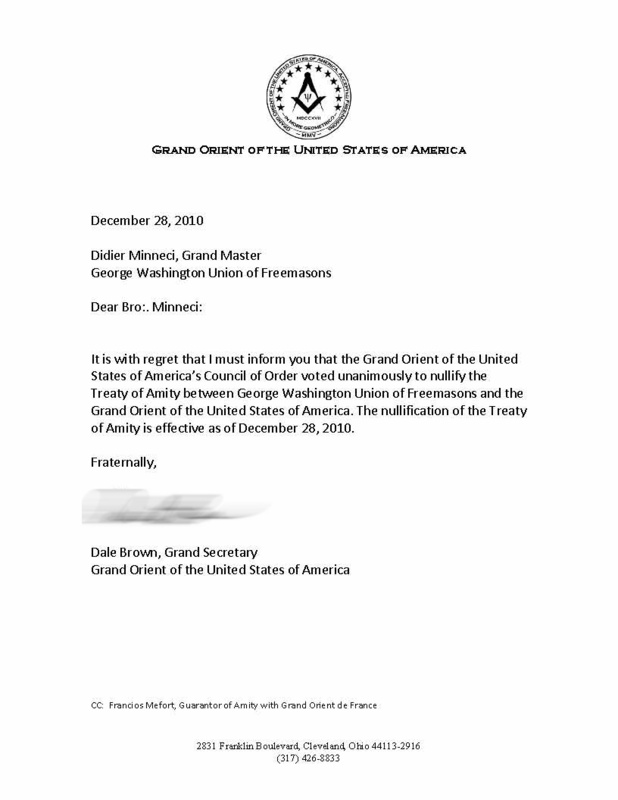 The Grand Orient of the USA was created between 2005-2006 by a group of expelled or disgruntled mainstream Freemasons from Georgia and other jurisdictions. The GOUSA has been troubled since its beginning, marked by the rapid resignation of its first two Grand Masters. 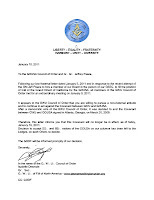 The GOUSA signed a treaty of some kind with the Grand Orient of France in 2008 (which is also considered irregular and is unrecognized by the overwhelming number of Masons and grand lodges around the world). Other messages have been circulating that all is not well with the GOUSA's high-visibility Halcyon Lodge in Cleveland, Ohio, touted as the GOUSA's big success story. Halcyon settled the lawsuit brought by the Grand Lodge of Ohio F&AM seeking to prevent the renegade lodge from turning in nits charter, transferring the temple property to a new organization, and going rogue. But now there is apparently a split within the lodge's membership about their future direction. 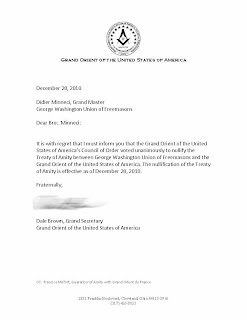 As a purely casual observer, it will be interesting to see if the Grand Orient of France now dissolves its treaty (or whatever it is) with the GOUSA, in support of the GWU. Admittedly, this is pretty inconsequential stuff in the grand scheme of things, but it is worth reporting because of the inflated internet presence the GOUSA has displayed over the few years of its life, and the lavish claims of its supporters. In the interest of correcting the timeline, I have been sent a copy of a letter sent from the GOUSA to the GWU, severing relations a week before the GWU letter was issued (click letter to enlarge). Actually our obedience is almost double the number of members stated in that report, but is still quite small compared to the American Grand Lodges. I have seen the same number mentioned on Mr. king's masonincinfo page, and while it may have been accurate at one time, it is not accurate now. Liberal Freemasonry of the GO type has not grown as much as I would like to see in the United States, but despite our numbers, we have serious and dedicated Brothers and Sisters working in our lodges. Besides our people in the GWU, the members of the Women's Grand Lodge of Belgium, of LDH, and the Grand Orient of France-North America that I have met have all been high quality individuals and very sincere in their practice of Freemasonry. The fact that there have never been any controversies or online issues with our, or these other obediences I mentioned, speaks to the quality of our members, and the peaceful nature of our work. The GWU, and the obediences I have mentioned, have always avoided conflict with the mainstream Grand Lodges, whose members are respected by us as fellow masons, regardless of their feelings towards our lodges. The GWU (from my own experience), has no interest in generating conflict, controversy, or "sticking it" to the mainstream Grand Lodges. Our obedience goes about its work quietly and has no interest in making waves, or stirring up discord. Of course I am speaking on behalf of myself, and I do not speak in any capacity for my obedience, the GWU. Thank you for allowing me the privilege of making these observations. Peter, just as a casual bystander, I always wondered what the GWU leadership was drinking, er, thinking when it entered into whatever alliance it had with the GOUSA. One coreection: The GOUSA actually withdrew from the agreement first due to philosophical differences, but did not make news about it. We were silent, so, in turn, the GWU had withdraw in retaliation, which is fine and tough to do when one of the parties already withdrew. No need to split hairs though, I just feel Brother Hodapp likes to report Truths. And yes, growing pains, just like in the 1700's. Masons had problems as well. It amazes me to this day how easy it is to spread false rumors. Too bad you are a willing participant. It simply shows individuals adgendas and small mindedness. Chris H, you have access to enough people, even at Halcyon to call or email to verify such non-sense before spreading it further. There is no disharmony at Halcyon. We had a guy transfer from a GLofOhio lodge last year and in the last 5 or 6 months he brought 3 of his friends to the lodge. The three received EA degress. These newly minted members announced the other week that they wish to do something else. This is hardly the 'split' that some adgenda-driven individuals are pumping it up to be. I am Chris Michalek. If you don't know who I am then spend 2 seconds checking around. I am well known. I am a long known person at Halcyon and I personally accepted the "PATENT" (that whatever document you refer) from the GOdF for the GOUSA. Halcyon is very fine and Halcyon stands tall with GOUSA through thick and thin. Please exercise some judgement before you spread non-sense unchecked in the future on this little sewing circle website. Dishonesty on the part of the GOUSA, such as these statements, figured into the GWU's decision to terminate the treaty, as I understand it. The treaty between the GWU and the GOUSA was terminated by the Executive Board of the GWU, not by the GOUSA,unless "not making news about it" involved not informing the GWU that the treaty was over. An obedience's objections to attempts to poach its members hardly represents "retaliation". Again, I am speaking for myself, not my obedience, but why does the GOUSA have such a problem with honesty? As a postscript to my previous comment, it is quite possible that 2 Bowl actually believes that GOUSA ended the treaty. Knowing what I do of the individuals involved, he may have been given false information regarding the facts of the case. If that is true, it is not my intent to accuse him of dishonesty personally. The facts are what they are, and I sincerely hope that accusations against the GWU and its integrity are not forthcoming from some quarters. The balance of the evidence in such a case would not be favorable to those involved. I wish you could see the look of surprise on my face. I knew I could count on someone from Halcyon to make sure the rest of us were corrected. That thimble is right next to your feet? oh, but when one cannot see their own feet, then one would not be able to their thimble. Also, I highly doubt something could ever slip off those sausage fingers that are all bloated. Thanks, Mister Coste. Another glowing example of the superior sort of "Mason" drawn to the Grand Orient of the USA. Wouldn't be a little better if all playhouses just ignored the other? I mean no version of Free-Masonry has the biggest sandbox and no sandbox is perfect. Can we agree to to disagree? Let each variety take it's place and those who feel lead to that one version they like do so in peace. Quiet frankly all this line drawing is getting VERY old. The size of the sandbox------wow!.....I was thinking about joint gwu!!!!! Happy New Year. And Thank You.